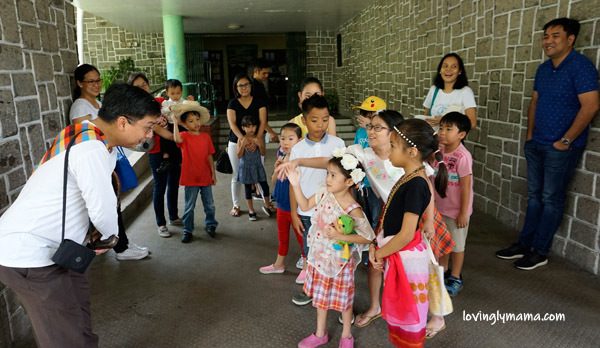 For Buwan ng Wika, the families of the Bacolod Homeschoolers Network trooped up north in order to experience the Silay Heritage Tour. We all went to Silay City, Negros Occidental, which is also known as the Paris of Negros. The Bacolod Homeschoolers Network with Mr. Cidni Mapa at the Cinco de Noviembre marker in Silay City. We are celebrating Ara ng Lahi with a Silay Heritage tour. While homeschooling in Bacolod, members of our network try to gather at least once a month in order to hold events. For August, we join the nation as we celebrate Buwan ng Lahi or National Heritage Month. 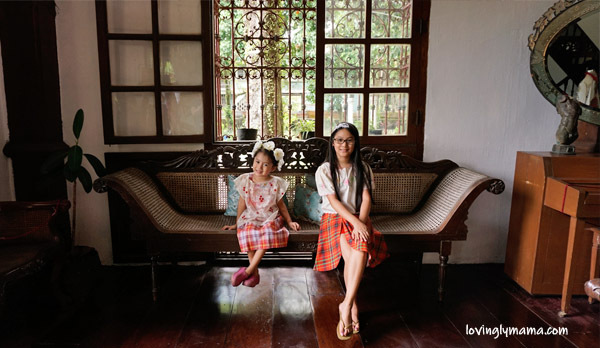 Clad mostly in traditional Filipino costumes for kids, our children set out to appreciate our local culture. They were able to learn a very important part of Negros history, see a lot of art works, and relive the lifestyle of the past. Our tour was conducted by Mr. Cidni Mapa, a Department of Tourism (DOT) accredited tour guide. Ang dalagang Pilipina plays the Filipino game called sungka at Balay Negrense. We met around 1:45pm at the Silay Cultural Center beside the public plaza. Then we set out on foot across the street to the Silay City Hall. Our assembly was at the Silay City Cultural Center. The local culture and the arts scene in Silay City is very vibrant because of government support and cooperation of the people. Assembly at the Silay Cultural Center. 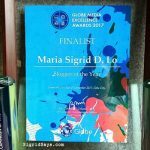 Local culture and the arts are strongly encouraged in Silay City. So much government support.On the courtyard in front of the government office are statues depicting how sugar was made back then. Mr. Mapa explained the production of the mascobado sugar. As you know, the sugar industry is the bread and back bone of the province of Negros Occidental. We no longer went inside the Silay City Hall. Mr. Mapa just explained the process of making sugar, which is depicted in this scene in front of the city hall. Our first stop was the marker at Cinco de Noviembre Street in Silay City. The street was named to commemorate the historic event that happened in November 5, 1898. The marker was a replica of the house and pharmacy of Jose Locsin as well as canon. The revolt, now popularly known as the Negros Revolution, started in Central and Northern Negros. It spread to other towns, including Cadiz City in the north. It was the beginning of the end of the Spanish colonial rule in the island of Negros. Yanna is sharing what she knows about the Negros Revolution. To commemorate this historic event, we have now set aside November 5 as the Negros Day or Negros Revolution. It is a special non-working holiday in the province and different celebrations are held in various cities and municipalities. Ito sits on a real canon at the Cinco de Noviembre marker. At the marker, the kids learned about the heroic acts of the Negrenses back then leading to the revolution. Despite the lack of funds, Negrense forces led by General Juan Araneta defeated the Spaniards with some cunning and lots of bravery. The Balay Negrense is the Victor Fernandez Gaston Ancestral House. 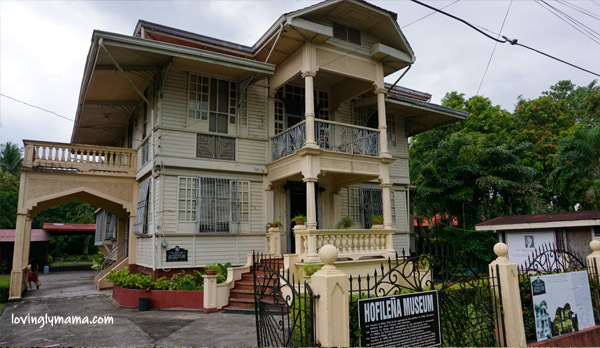 It is now a museum in Silay, and is just a few meters away from the marker. It stands proudly along Cinco de Noviembre Street. Balay Negrense museum along Cinco de Noviembre Street, Silay City. The house showcases the opulent lifestyle of a late 19th-century Negrense sugar baron. They had fifteen children and we were given a glimpse of their lives back then. A tour guide for the museum showed us around. She was well-versed and spoke very good English. The Balay Negrense is notable for being the first museum to be established in the province of Negros Occidental. Shane with a beautiful gown on display at the Balay Negrense. Our guide at Balay Negrense. The Hofileña Ancestral House is the residence of the late Manuel Severino Hofileña. It is also located along the Cinco de Noviembre Street. Mr. Hofileña used to live here with his beloved wife Gilda Ledesma Hojilla, a former Miss Silay, and their nine children. The Hofileña Museum, also along Cinco de Noviembre Street. This is several blocks away from Balay Negrense, so we took the car going here. This is indeed a good-looking family. One of their grandchildren, Rey PJ Abellana became a movie actor. 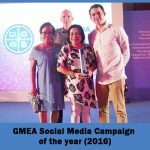 His daughter, the beauteous Carla Abellana, is also a talent of GMA. 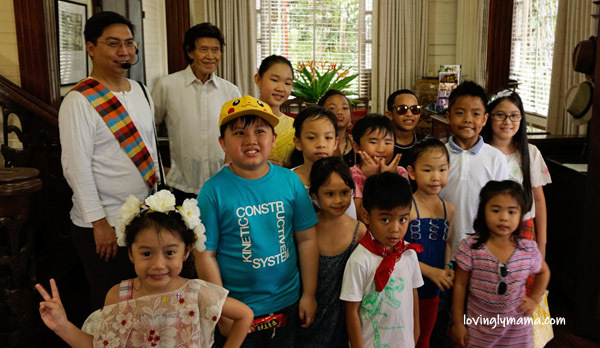 The kids with Mr. Ramon Hofileña at the Hofilena Museum. At present, Mr. Ramon Hofileña, one of the children and heirs, resides in this ancestral house. He personally conducts tours around their ancestral home. We were lucky to have caught his after one of his tours and the children had a photo opp with him. We were still supposed to go to the Bernardino Jalandoni Museum, also known as the Pink Museum. But it was already around 4:30 and the kids were getting restless and hungry. So we skipped this one. You gotta be flexible with kids. Our Silay Heritage tour took very long because the kids were not concerned about posing for just photographs. They checked exhibits and asked questions — lots of questions. They were very interested with the stories of the past. Our last stop was for snacks. 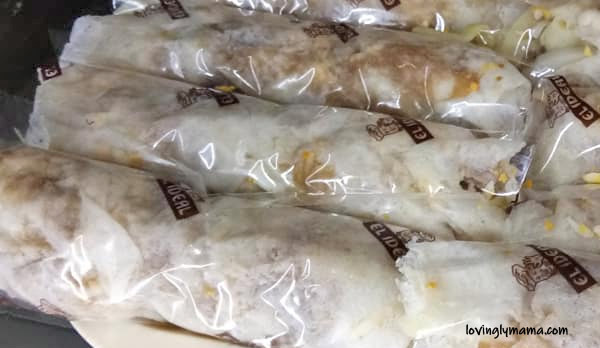 We went to the iconic El Ideal Bakery along Rizal Street (main highway). It is a favorite stop among tourists going to the Bacolod-Silay International Airport or among tour groups. Locals also travel to Silay just to enjoy their foods. 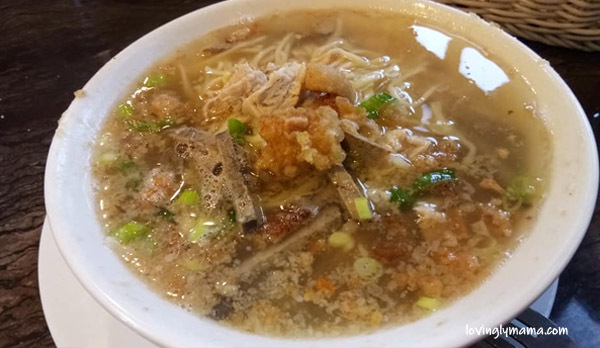 Since it was raining, several of us had batchoy at El Ideal. We got to enjoy their batchoy, pies, and short orders. Plus, we bought a lot of pasalubong to bring home. And of course, I didn’t pass on the chance to have fresh lumpia – my favorite! The Silay Heritage tour that we had with the Bacolod Homeschoolers was a learning opportunity for all of us. 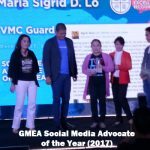 Most of us parents, who just live in Bacolod, have not done this either. So we also got to learn with our kids. 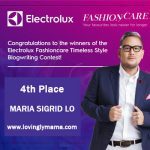 That’s why they always say, “Huwag maging turista sa sariling bayan.” But we did just that, because we gotta start somewhere. 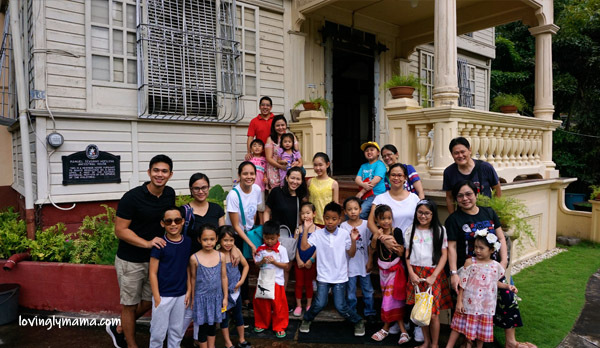 The Bacolod homeschooling families that joined in the Silay Heritage Tour. The tour was tailor-made with young kids in mind. You can have more in day tour of Silay City, as there are so many nice places to explore there. Simply make arrangements with the guide. If you would like to embark on a Silay Heritage Tour, you can do it yourself if you’re a local. But if you want detailed information on history plus some fun side stories, contact a tour guide. Our tour was graciously done by former Tanjay City, Negros Oriental Councilor and DOT-Accredited tour guide, Mr. Cidni Mapa. Mr. Mapa is the President of ATON — Alliance of Tourguides of Occidental Negros, a local Tour Guides association. He also serves as contact person for the other Tour Guides when needed. For inquiries and tour bookings, you may call him at 0918-9349438. This is the Philippines, so expect it to be hot and humid. Kids can get cranky in the heat so let them wear light clothing. It is also best to bring an extra change of clothes and towels. And bring fans, too. 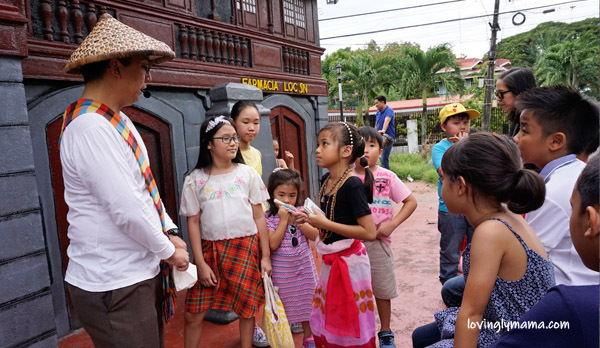 We opted to let them wear traditional Filipino costumes for kids that’s usually associated with Visayan culture — the kimona and patadyong for the Silay Heritage Tour. Thankfully, these are made of light materials. To prevent dehydration, bring bottles of water for everyone in the family. If restrooms are not easily accessible, let the kids take sips from time to time. It should not be more than 30 minutes intervals. Our Dindin gets a headache when dehyrated. Even if your tour has a set time for snacks, delays are inevitable. And children can hungry. Before they get into “hangry” mode, give them something healthy to nibble on while they are walking. Just make sure to let them drink water afterwards and clean their hands properly. Children usually touch museum exhibits and their hands can contaminate the heirloom pieces. Let them wear comfortable shoes. We don’t want to carry our young children around on a walking tour. That would be back-breaking. So it is best to let them wear comfortable shoes that could last them most of the tour (at least). Weather in the Philippines can be so unpredictable. While it is cumbersome, we have to be ready with umbrellas, raincoats, jackets, and hats. Despite having a such sunny day, sometimes, the rain can just pour without warning. So it is best to be prepared. Since the houses included in the Silay heritage tour have gardens, there would most likely be mosquitoes. If your children are susceptible to mosquito bites, protect them with a layer of mosquito repellent. This would also prevent dengue infection. If you want a nice family picture, lug a tripod around. It was just good that my kumare Pynky took a nice shot of us. But in all our travels, we bring a tripod for perfectly composed family photos. Many times, our photo would be blurred or not composed properly, no matter what instruction you give to the bystander that you requested to take your photo. Our family at Balay Negrense. I can only imagine having 15 kids. So to avoid frustration, the tripod is your best friend. 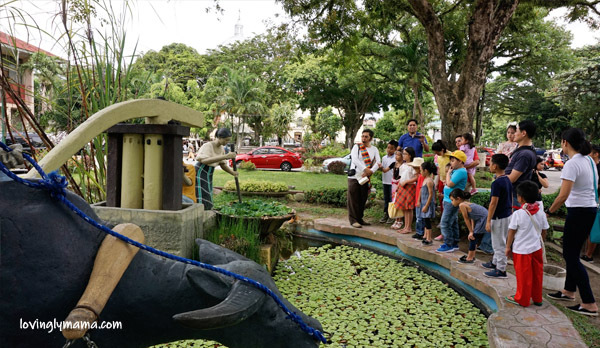 What a fun trip and all of the kids look excited with the Silay Heritage Tour. My sister homeschools her daughter and they plan similar trips with other homeschoolers. I think it’s a great way for kids to interact with other kids. 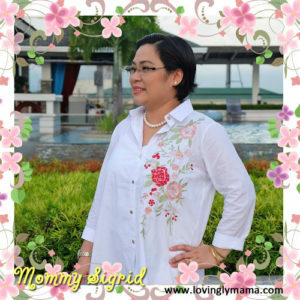 I must confess, I until I read your post I had no idea Spanish was spoken in the Philippines! I ended up doing some extra research. The Silay heritage tour sounded like it was incredible and super informative! I definitely need to visit the Philippines. Any adventure with the kiddos have to be planned for sure. 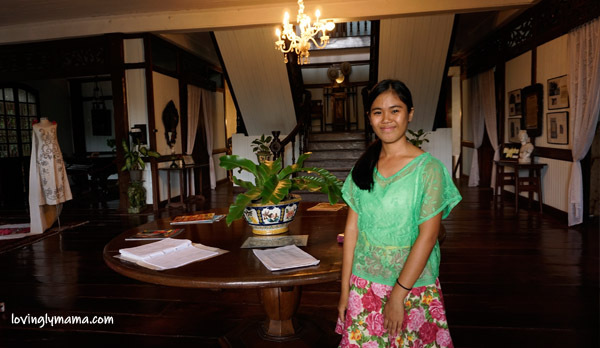 Your surely had such a learning experience on your Silay Heritage tour. Great tips on how to prepare for the heritage tour and even more impressive pictures. Very interesting post and opportunity for the parents and the children. I have never been to the Philippines. This post was a mini history lesson for me and a great preview if I ever get to the area. I am sure the children will never forget their visit. We will take this Silay Heritage Tour as well. But we will make it the whole day! Wow, this must have been such a cool experience. 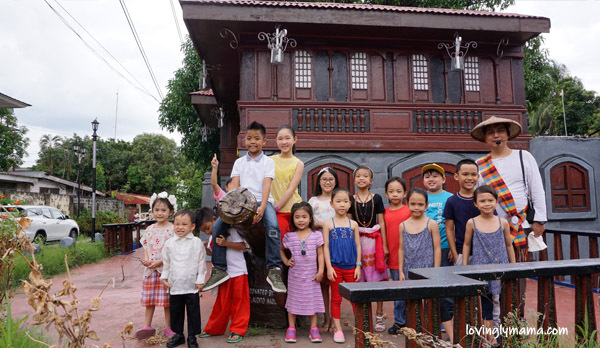 I’m sure your kids had such a great time learning about their history and culture during their Silay Heritage Tour. If ever I am in Silay City, I won’t pass up the chance to take this tour. It’s great to hear the history behind places we visit or live. Some of the things I remember most as a kid is learning history behind places (or things, such as those that appealed to me in museums). 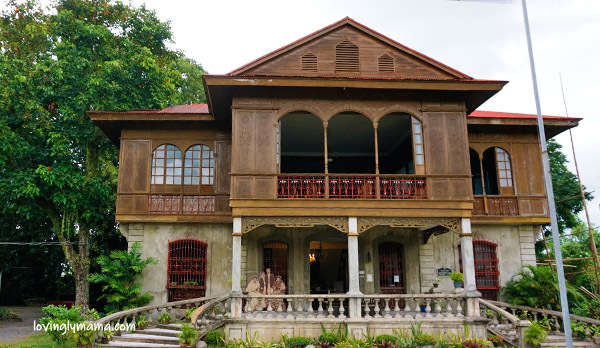 This Silay Heritage Tour should be taken by visitors to Silay City. 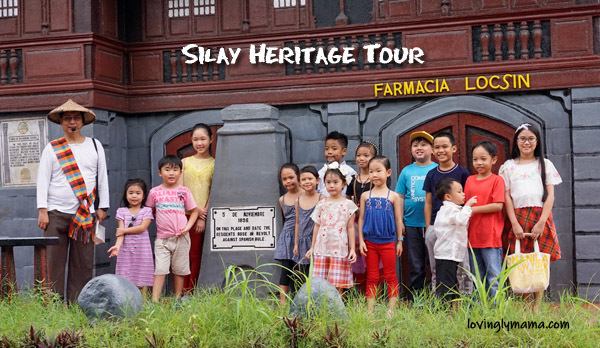 It must have been such a cool day out and experience for the kids to go on the Silay Heritage Tour! So much history! so many things to learn, for both parents and kids! 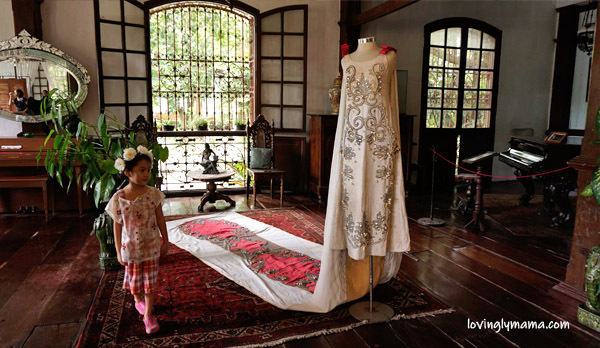 Looks like a great time for the homeschooled kids to have the Silay Heritage tour in their Filipino costumes for kids. I had no idea that spanish was spoken in the Phillipines. What a fun trip and all of the kids look excited with the Silay Heritage Tour. I had no idea Spanish is spoken in Philippines. Very informative post. Really fun looking tour. 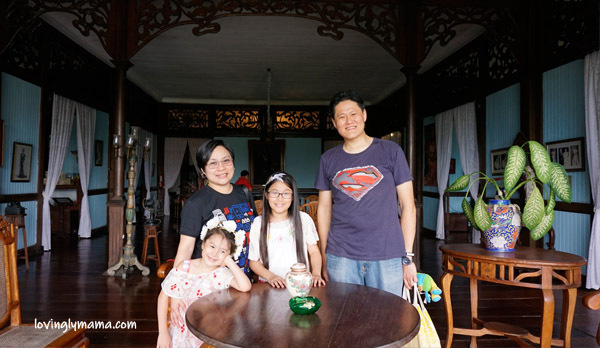 I love your tips for bringing kids on the Silay Heritage tour. Keeping kids hydrated is important. Photographs are simply beautiful. and the food looks yum too. 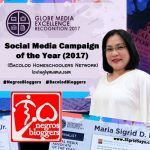 Just today, I was reading on how frequent getaways are as important for kids who do homeschooling so I must commend you for organizing such event for kids who home school. Particularly, I love the visit to the museum but yes, all the events of your Silay Heritage Tour are great! I love tours like this. It reminds me of the history and the culture. I will recommend this Silay Heritage Tour to my friends near the area. How fun! We are also homeschooling and will be looking at homeschooling trips to do with our little ones here in the states. We will also find something like the Silay Heritage Tour among our small towns. It’s nice to find out about local culture. What a great trip and tour you all had. My children loved to go to museums and get out especially during the time I homeschooled them. 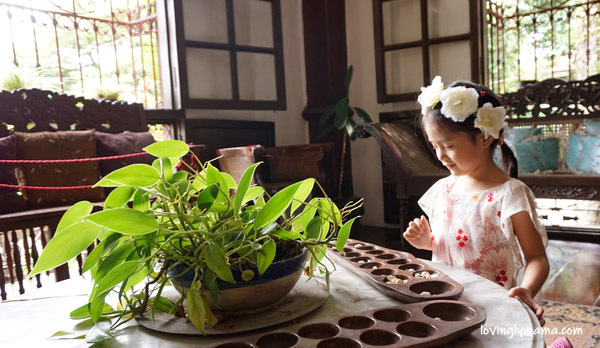 The Silay Heritage Tour is truly something to do for any homeschooling family.